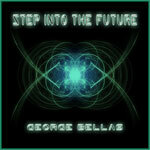 Whatever you have thought or remembered of guitar giant George Bellas, you can leave it all behind with his new work 'Step Into The Future.' Outside of Palace Terrace, which I did not review on Dangerdog, I haven't listened to much of George Bellas lately. My first experience with Bellas was on the Mogg/Way's (UFO) first venture 'Edge Of The World.' Frankly, I thought he was a mismatch for them with his fret work being way too wiggly for me and the compositions. But, with 'Step Into The Future,' I can tell I've been missing something. And that something is the maturation and progression of a promising talent into an exceptional talent. 'Step Into The Future,' a single piece clocking in at over 70 minutes, is a first-class work of progressive, sometimes avant garde, guitar driven rock. Don't let the length threaten you. You can easily trace the movements if you allow your ear to listen carefully. Certainly, you can expect some fine fret work throughout, but don't go looking for the strict shredding style. No, Yngwie, Satriani, or Gilbert are not here. Frankly, I don't think any of them would jeopardize their careers with this diverse material. Rather, Bellas varies from neo-classical to jazz to psychedelia to rock to fusions of one or more of these styles. Honestly, what 'Step Into Future' reminds me of is early Todd Rundgren's Utopia meshing somewhat with Brand X. The depth and breadth of 'Step Into The Future' requires some attentiveness while listening. I would suggest that you not devote your mind to something that requires similar concentration while listening. When have you been able to say that about an album? Unfortunately, this will be the album's downfall for many. If you leave this for background music or set your mind to something else at the same time, you'll miss the creativity and sophistication present here. Expect short segments or basic shredding and you will be disappointed. This is not just a work for guitar aficionados, it's for those who want their guitar heroes to be better, even a bit more technical, expressive and progressive beyond the normal fare or expectations. The depth and breadth of 'Step Into The Future' requires some resourceful and sustained attentiveness while listening. When was the last time you could say that about an album? This is not just a work for guitar aficionados, it's for those who want their guitar heroes to be better, even a bit more technical, expressive and progressive beyond the normal fare or expectations.